Can you believe it’s almost 2019? The New Year means it is time to set up your next planner! 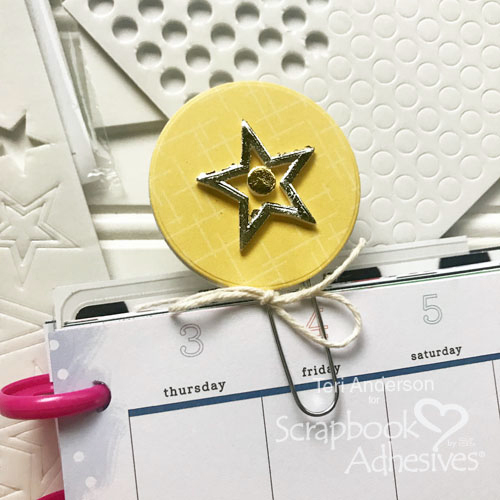 Teri here today, and I’m going to show you a fun way to add a touch of creativity and organization to your planner by making some simple DIY Foiled Planner Clips to use in it! 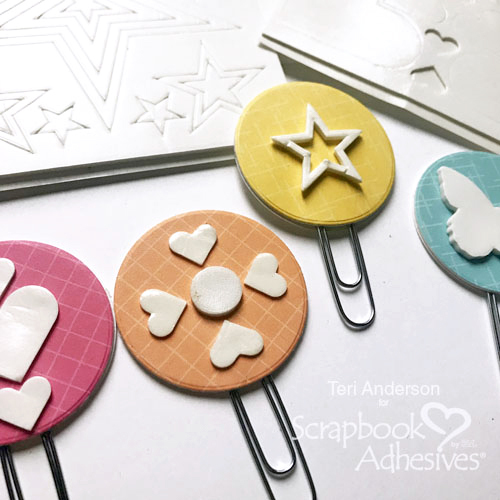 These sweet paperclips are easy to make with 3D Foam Products from Scrapbook Adhesives by 3L. Start by cutting down one 3D Foam Creative Sheet with your paper trimmer to 4 inches by 4 inches. 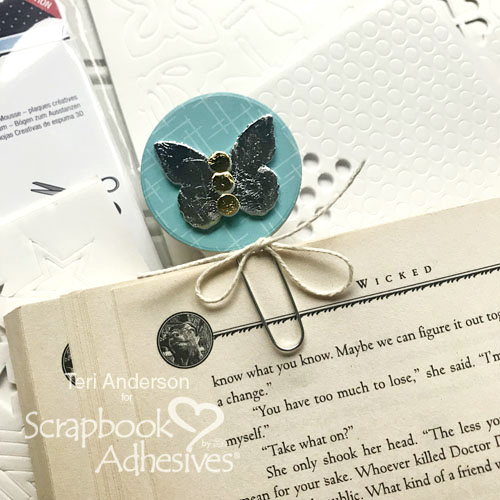 The 3D Foam Sheets are from the 3D Foam Creative Embellishment Kit. If you don’t have a paper trimmer you can use scissors. Simply mark a line with a pencil and cut. It’s that easy. Cut four squares of patterned paper. Remove the backing paper on one side of the 3D Foam Creative Sheet. Place the paper pieces on it. 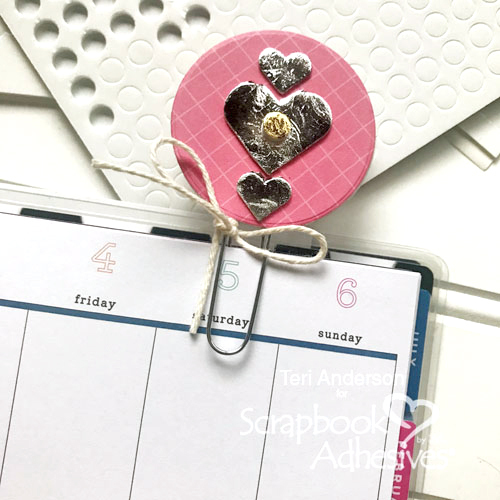 Set a circle die over the sheet and run it through your die-cutting machine. You’ll repeat this process until you end up with four patterned paper circles. Alternatively, you could use a circle punch. 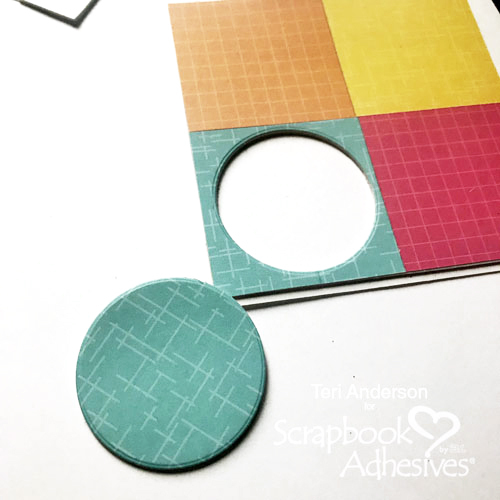 You’ll also want to use your circle die to cut four circles from white cardstock. Flip your patterned paper circles over. Remove the other piece of backing paper from each one. Set a paperclip on each circle. Be sure to put the single loop side onto the adhesive. 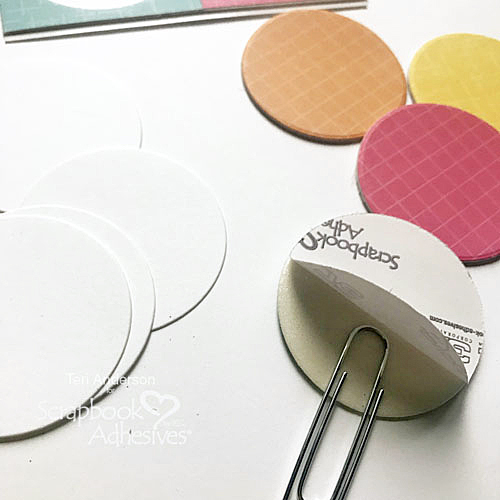 Place one of the cardstock circles over the clip and onto each circle. Repeat this process until you have four circle-topped paperclips. 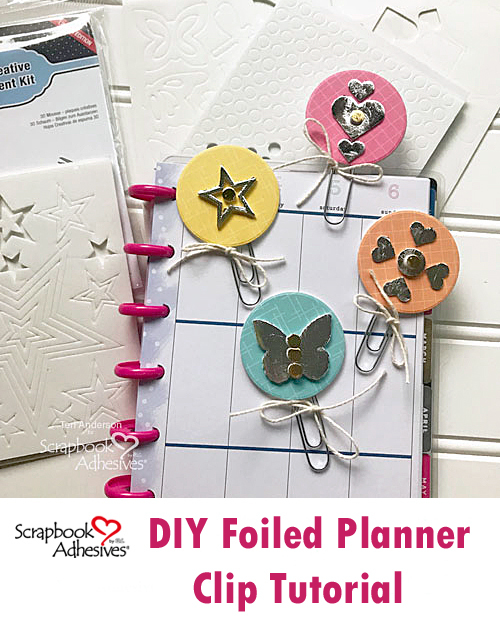 Now, it’s the time for the fun part: decorating the planner clips. 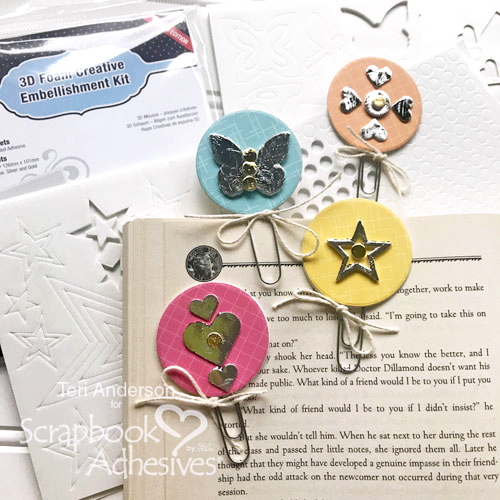 Scrapbook Adhesives by 3L has a number of awesome fun 3D Foam Shapes that work for this project! We’re going to use the 3D Foam Stars, 3D Foam Hearts and 3D Foam Butterflies today. but you may want to use a different shape on future clips. 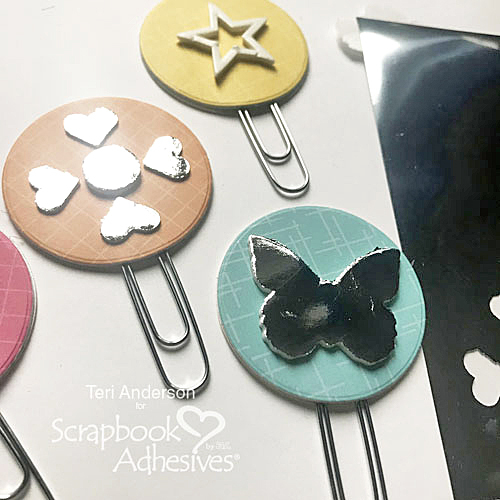 Take some of the 3D Foam embellishments and mount them to each clip. Be creative! Look for ways to use different shapes together to make an interesting design. Remove the paper liner on top of each 3D Foam Shape. Use your fingers to burnish foil onto each shape. 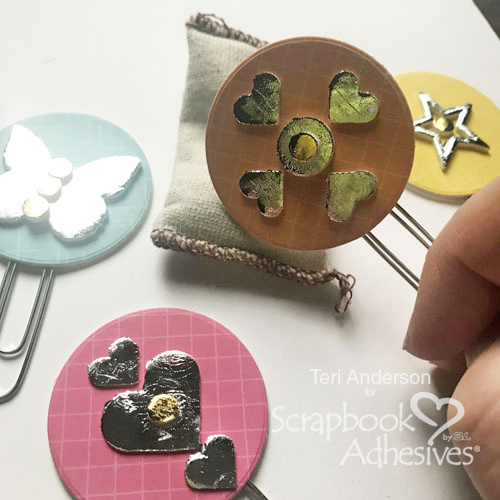 There are five different colors of foil that are included in each of the foil kits: 3D Foam Creative Embellishment Kit, Metallic Transfer Foil Variety and Metallic Transfer Foil Holographic kit. You could call things good, but we are going for a two-toned foiled look with these clips! Take some 3D Foam Circles and adhere them onto each clip. You can place them on or next to the shapes you’ve already added foil to. Select a second color of foil and then burnish it to each of the 3D Foam Circles. 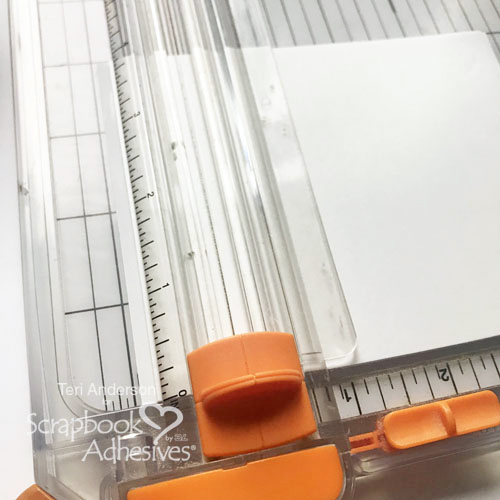 If you are worried about there being any sticky residue from the foam on your clips, rub each clip on a non-static embossing bag. Don’t have one of those? Use a sheet of fabric softener instead! Complete your clips by adding a bow to each one with twine or ribbon. 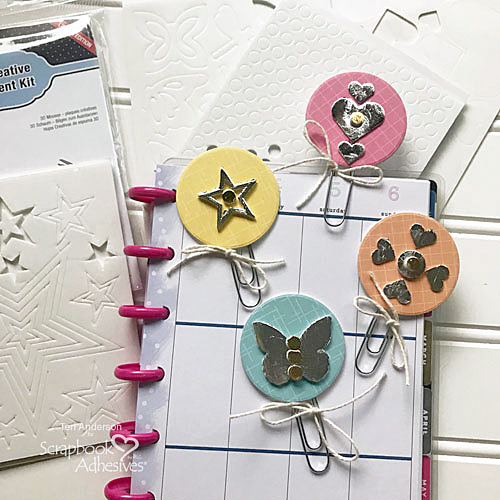 These clips look amazing when used in a planner! 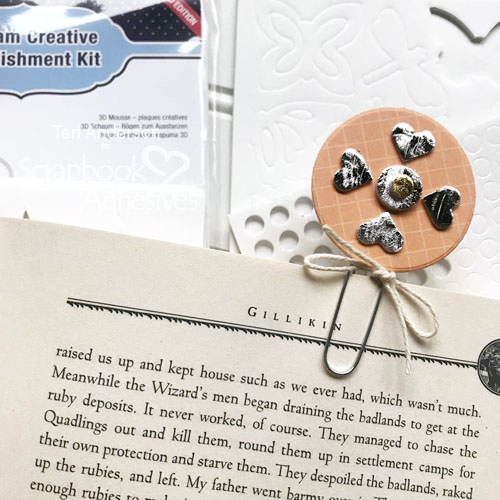 They also make great bookmarks! You may want to make a few to use as you tackle your reading list for the new year. This entry was posted in 3D Foam Circles, 3D Foam Creative Sheets, 3D Foam Shapes, Adhesives, Beginner, Crafts & Tutorials, Metallic Transfer Foil, Permanent Adhesive, Planners, Seasonal Craft Ideas, Skill Level, Spring, Tutorial, Wear your Adhesive on the Outside and tagged 3D Foam Butterflies, 3D Foam Creative Embellishment Kit with Foil, 3D Foam Creative Sheets Mix, 3D Foam Creative Sheets White Small, 3D Foam Hearts, 3D Foam Stars, Avery Elle, Bookmark, Die-Cutting, Foil, Metallic Transfer Foil Holographic, Metallic Transfer Foil Variety, Planner, Spellbinders Paper Arts, Teri Anderson, Tutorial, Twine, Wear Your Adhesive on the Outside, Whisker Graphics. Bookmark the permalink.